Penn State had maybe the best stretch of anyone last week. They downed a ranked Purdue team for a Big Ten road win and followed it up with their first victory over Nebraska, at the time the fourth-ranked team in the country and now fifth, since 2014. That vaulted Penn State up the rankings to #4. A key factor in the success has been Nia Reed, who ever since returning from an undisclosed injury has been a difference-maker for the Nittany Lions. Reed missed four matches for the Nittany Lions, including their first two in conference play. Prior to her absence they were 7-1 with her in the lineup and 21-3 in sets. Then, in the four-match skid sans-Reed, Penn State went 2-2 and 7-7 in sets. She’s now been back for six matches in which the team has gone 6-0 and 18-3 in sets. All together, that makes Penn State 13-1 in matches and 39-6 in sets with Reed playing the match. Without her, they’re 2-2 and 7-7 in sets. Of course, one of those losses came to Minnesota, but the other was in four at Ohio State, a team they would down with Reed back at home in straight sets (and 75-57 in total points). Even furthering how important she is to the team is that freshman middle blocker Kaitlyn Hord, who leads the team in hitting percentage and is second in blocks per set, was out for both matches this past week. They still won both, including that match against Nebraska as Reed posted 20 kills, four digs and three blocks. 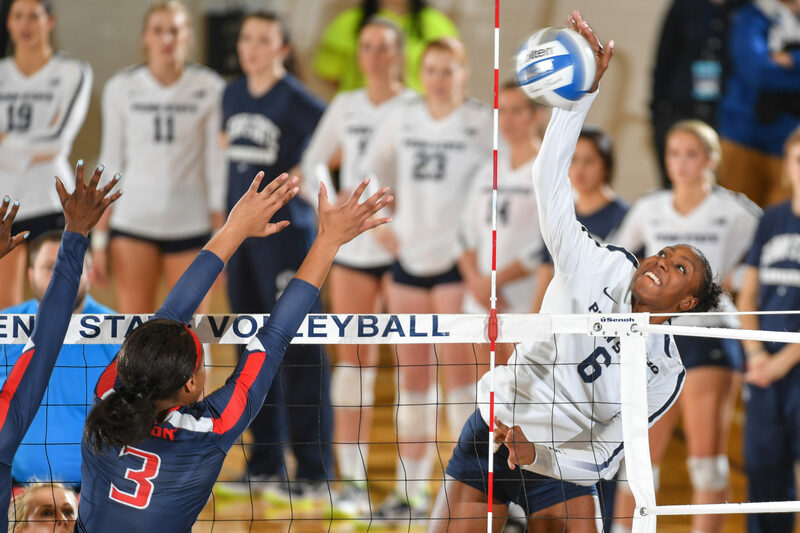 In total on the season, the 6’1″ redshirt senior outside hitter leads Penn State in kills per set and is the most efficient of the pin players. Specifically, she has 140 kills (3.18 per set) on a .261 mark to go with 30 blocks (0.68 per set) and 27 digs (0.61 per set). She was slowly brought back in her first three matches – though still hit .272 on over two kills per set – but over the last three matches her per set numbers are 3.83 kills on a .231 clip, 0.83 digs and 0.58 blocks. Penn State, who is 15-3 (6-2, Big Ten), continues their season this week with a pair of meetings against Rutgers at home (Wednesday night) and on the road (Saturday night).